The number of people living on the streets in Los Angeles and San Diego, two epicenters of the homelessness crisis, fell this year, suggesting possible success in those cities' efforts to combat the problem. In a story Dec. 17 about a count of homeless people in the U.S., The Associated Press reported erroneously which tax Los Angeles Homeless Services Authority Executive Director Peter Lynn credited for helping reduce homelessness in the 2018 count. Lynn was crediting a Los Angeles city ballot measure that was adopted in 2016, not a county one adopted in 2017. A federal report released Monday provides a possible glimmer of hope for the homeless crisis that has gripped many cities up and down the West Coast. The number of people living on the streets in Los Angeles and San Diego, two epicenters of the homelessness crisis, fell this year, suggesting those cities’ efforts to combat the problem could be starting to pay off. In Los Angeles, the count fell by 3 percent after a sharp increase the year before. Peter Lynn, executive director of the Los Angeles Homeless Services Authority, said that can be credited to results of six months of increasing affordable housing availability after Los Angeles city voters raised taxes to help in 2016. In 2017, Los Angeles County voters approved another tax increase to provide homeless services, a factor Lynn said will start showing up in future counts. “We’re also dealing with the countervailing pressure of housing markets that are pretty unforgiving,” he said. 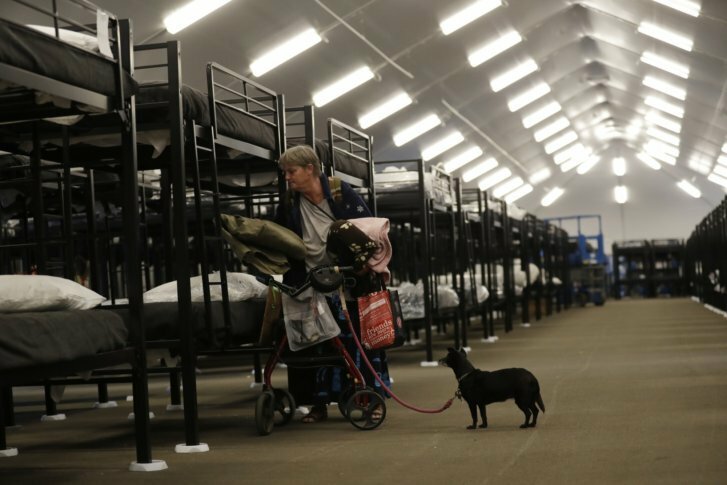 Cities in California, Oregon and Washington have driven an overall spike in the number of homeless people nationwide in recent years. This year’s count continued that trend, showing 552,800 people without homes across the country, up by about 2,000 from 2017, according to the U.S. Department of Housing and Urban Development’s point-in-time tally. It was the second consecutive increase after seven straight years of declines. The number of homeless referred to as unsheltered — those living in the streets, encampments or other open places — was more than 194,000 nationwide. That also was up from last year. More than 37,000 of the unsheltered were in the Los Angeles area this year, down 2 percent from 2017. San Diego, California’s second most populous city, also saw a decline in both total homelessness and those on the streets. After a hepatitis A outbreak spread among the homeless population and killed 20 people in 2017, the city turned to industrial-sized tents to house hundreds of people. As the tents went up, officials also cited people camping on downtown streets. Encampments downtown cleared out quickly, but the number along the San Diego River doubled. The city is considering a ballot measure to raise money for affordable housing in 2020. Nationwide, the overall increase this year was driven by a 2 percent rise in the unsheltered homeless population — those living in vehicles, tents and on the streets — along with 4,000 people in emergency shelters after hurricanes, wildfires and other disasters, according to HUD. The numbers of homeless veterans and families continued their long-term declines. At a time when rents are rising faster than wages — especially for lower-income people — an essentially stagnant count is a not a bad sign, said Steve Berg, vice president for programs and policy at the National Alliance to End Homelessness. “Given what’s going on with rental housing, it’s not exactly good news. But it means communities are pushing back against the headwinds,” said Berg, who like other advocates urges caution about reading too much into one-year trends in the homeless count. The homelessness data picture is incomplete because several West Coast areas with large populations, including San Francisco, Portland, Oregon, and California’s Orange County, did not conduct new counts of unsheltered homeless populations this year. Those places will do fresh surveys in early 2019. Homelessness has exploded along with a soaring economy in several West Coast cities in recent years and has become a hot local political issue. From 2015 through last year, voters on the West Coast approved more than $8 billion in spending — most of it in tax increases — to address homelessness. In Seattle, which has the nation’s largest homeless population outside New York or Los Angeles, the count this year rose to more than 12,000 — more than half of them unsheltered. The number was less than 9,000 just four years ago, and the city has been wrestling with what to do about the problem. The City Council in May passed a $48 million tax on businesses to raise money for affordable housing. But under pressure from Amazon, Starbucks and other companies, it repealed it the next month. Another place in the West with a rising number was the Phoenix area, where the total count this year was nearly 6,300, up 12 percent from the previous year. About two-fifths of people without homes there are in shelters. The region’s status as the fastest-growing county in the U.S., with 200 people a day moving in, is a factor in the rising homeless number, said Anne Scott, a human services planner who coordinates the count for the Maricopa Association of Governments. New York also had a growing homeless population, with nearly 78,700 people counted — up by more than 2,000. But because of a robust shelter system there, fewer than 1 homeless person in 20 counted is living on the street. Still, like the cities on the West Coast, officials struggle with how to get homeless people permanent homes. HUD Secretary Ben Carson said on a conference call with reporters Monday that no one should be declaring victory over homelessness despite decreases in certain cities. “We still have a long way to go even though there’s been significant progress,” he said.